Corn, cotton, and soybeans were up; wheat was down for the week. USDA Outlook Conference. Continue reading at Tennessee Market Highlights. Cotton, soybeans, and wheat were down; corn was flat for the week. It was a rough start to the week for corn, soybean, and cotton prices. Wheat prices tailed off at the end of the week due to lower prices from export com-petition with Russia and France. 2019 corn harvest futures prices continue to trade in a tight 10 cent range, $3.95 to $4.05. At the end of the week, corn futures were right in the middle of the range. Expect corn futures pric-es to move sideways with trade, South American weather, and U.S. planting intentions providing the potential to push prices out of the range. 2019 harvest soybean futures have started to plateau, moving sideways the past month and a half. Trade news between China will likely jolt the market lower or higher before the end of the month. Mixed soybean production reports for Argentina (up) and Brazil (down) provide potential offsets to current estimates. On Monday and Tuesday, December cotton futures dropped nearly 2 cents and then moved sideways for the rest of the week. Continue reading at Tennessee Market Highlights. 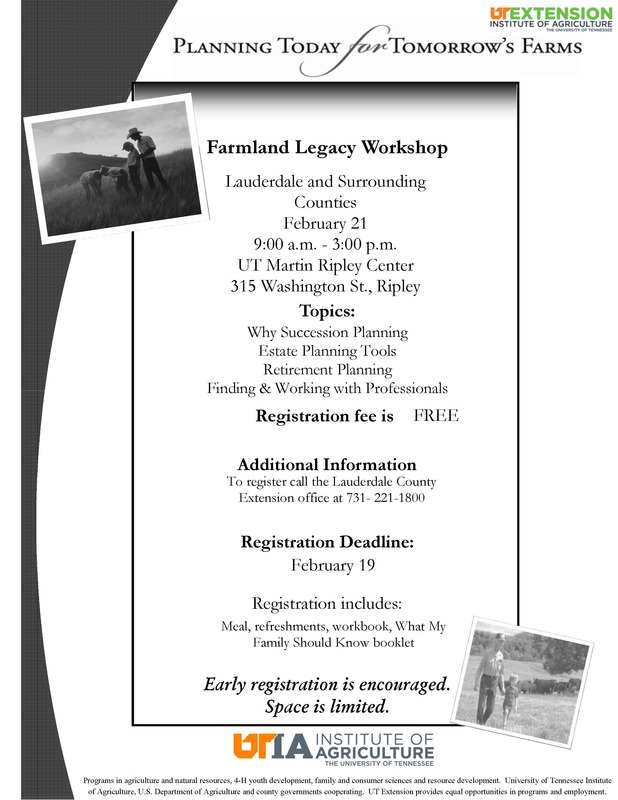 The University of Tennessee Extension is sponsoring a Farmland Legacy program on Thursday, February 21 at the UT Martin Ripley Center, 315 Washington St. in Ripley. The program will start promptly at 9 a.m. and conclude by 3 p.m. Lunch and workshop materials are included. This informative program will provide farmers and landowners with tools for estate and succession planning, wealth protection, farm management, and how to use this information to plan for the future. Many changes in estate tax law have occurred the last few years and it is important for producers and landowners to update or initiate their estate and succession plan. Planning the future of your farm can be a difficult and emotional task. 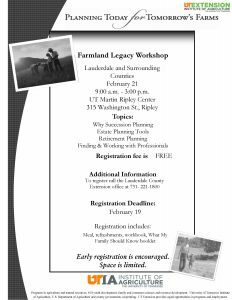 The Farmland Legacy Workshop will help in the planning process by providing valuable resources for all generations. Let the workshop help you start the dialogue with your family and plan today for the future of your farm. For additional information or to reserve your spot please call the UT Extension office at 731-221-1800. Tennessee corn stocks stored in off-farm facilities on December 1, 2018 totaled 29.7 million bushels, compared to 33.7 million bushels stored off-farm on December 1, 2017 according to USDA’s National Agricultural Statistics Service. Soybean stocks stored off the farm totaled 14.5 million bushels on December 1, 2018 compared to 13.4 million bushels stored off the farm the previous year. Tennessee wheat stocks stored off the farm totaled 8.6 million bushels on December 1, 2018 compared to 13.6 million bushels stored off the farm on December 1, 2017. Oat stocks stored off the farm on December 1, 2018 totaled 36,000 bushels, up 5,000 bushels from off-farm stocks this time last year. Continue reading at GrainsStocks1218_TN. Corn, cotton, soybeans, and wheat were down for the week. On Friday, the USDA released several reports that were delayed due to the partial government shut down. Highlights of key reports are presented be-low. Additional WASDE report details and analysis can be found at: Monthly Crop Comments. Nationally, winter wheat planted acres were estimated at 31.29 million acres, down 3.8% compared to 2018. U.S. winter wheat acres planted were estimated to be the lowest since 1909. In Tennessee, winter wheat planted was estimated at 330,000 acres, down 50,000 from 2018. Lower planted acres in Tennessee was largely due to wet conditions that delayed soybean harvest and limited fall/winter field work. Continue reading at Tennessee Market Highlights. Market Reaction: March 2019 corn futures closed down 2 ¼ cents at $3.74 ¼ with a trading range for the day of $3.74 to $3.81 ¾. December 2019 corn futures closed down 1 cents at $3.99 ¼ with a trading range for the day of $3.98 ½ to $4.04. Year-over-year reduction in domestic and foreign stocks continue to be a positive factor for prices. However, reduced ethanol use, greater planted acres in 2019, and continued trade uncertainty provide some degree of skepticism for price improvements. Continue reading comments and profitability update at MonthlyCropOutlook020819. Production of Tennessee dark fire-cured tobacco is estimated at 23.2 million pounds, up 10 percent from the previous year. Dark air-cured tobacco production is estimated at 7.42 million pounds, up 86 percent from last year. Tennessee burley tobacco production is estimated at 9.01 million pounds, down 50 percent from 2017. Yield was estimated at 1,700 pounds per acre, up 200 pounds from the 2017 crop. Harvested acreage was estimated at 5,300 acres, down 6,700 acres from last year’s crop. U.S. production is estimated at 100.4 million pounds, down 38 percent from last year. Burley growers harvested 61,050 acres, down 25 percent from 2017. Yields were estimated at 1,645 pounds per acre, down 332 pounds from last year. Corn production in Tennessee is estimated at 116 million bushels, down 5 percent from the previous crop. Yield was estimated at 168 bushels per acre, down 3 bushels from the 2017 level. Planted acreage was 730,000 acres, up 10,000 acres from last year. Acres for harvest as grain were estimated at 690,000 acres, down 20,000 acres from 2017. U.S. corn production is estimated at 14.4 billion bushels, down 1 percent from 2017. Yields averaged 176.4 bushels per acre, down 0.2 bushels from 2017. Area harvested for grain was estimated at 81.7 million acres, down 1 percent from 2017. Continue reading at PRJAN19_TN. Corn, cotton, and soybeans were down; wheat was mixed for the week. In January, December 2019 corn futures prices moved sideways opening the month at $3.97 ½ and closing at $4.00, up 2 ½ cents for the month. The January trading range was $3.96 ½ to $4.06. November 2019 soybean futures prices increased, opening the month at $9.36 and closing at $9.55 ½, up 19 ½ cents for the month. The January trading range was $9.35 to $9.65. December 2019 cotton futures prices moved mostly sideways opening the month at 73.38 and closing at 74.20, up 0.82 cents for the month. The January trading range was 72.24 to 75.20. July 2019 wheat futures prices moved sideways, opening the month at $5.18 and closing at $5.27, up 9 cents for the month. The January trading range was $5.17 to $5.40 ¼.
crop insurance guarantees. continue reading at Tennessee Market Highlights.